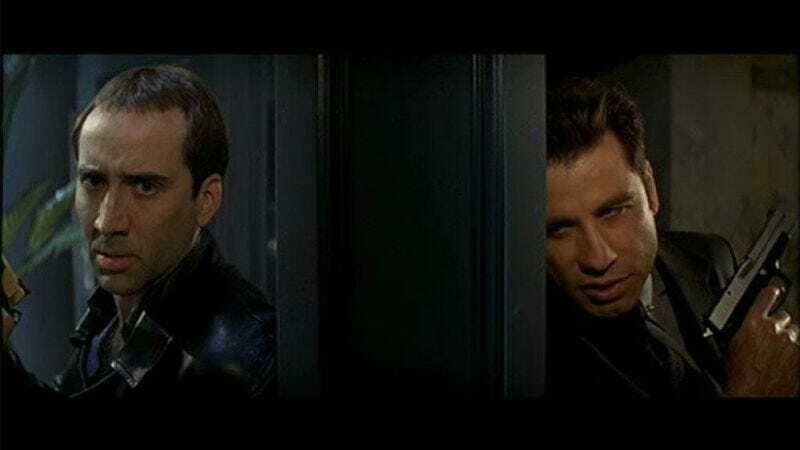 While latter-day Nicolas Cage still does the best big-screen Nicolas Cage impression, a close second would have to be John Travolta in 1997’s Face/Off, where the two actors hilariously replicated each other’s most obvious quirks in a way that elevated the John Woo thriller to big, dumb fun in the best possible meaning of the term. Now Vulture reports that Cage and Travolta are looking to do it all over again—not make fun of each other, of course, but rather put their increasing respective self-caricatures in tandem on a pair of projects they’re looking to do together. The first up is Shrapnel, a film that Die Hard director John McTiernan was looking to do before a pesky little prison sentence for lying to federal agents got in the way, but which may still begin shooting this June with or without him. The story concerns a former Bosnian soldier who gets his revenge on the American who wounded him by inviting him along on a friendly hunting trip, where it’s soon revealed he’s hunting the deadliest prey of all: Elk. Or, no—man. Man, we mean. No word on whether it would be Cage or Travolta playing the Bosnian and, most likely, growing an evil goatee. But really, it could go either way. Along with Shrapnel, the pair are also said to be eyeing Sea Trial from City Island screenwriter Raymond De Felitta, based on the novel of the same name by Raymond’s dad Frank. The thriller involves a pair of couples embarking on a romantic yachting trip, which quickly turns into a “cruise through hell” (according to the book’s cover) when one couple turns out to be not who they seem. So basically, Cage and Travolta are looking to try and kill each other some more—which is fine. It’s like when Dean Martin and Jerry Lewis reunited, only really tense and not intentionally funny. Actually, it’s exactly like when Dean Martin and Jerry Lewis reunited.